I have meditated for over 10 years, watching breath while sitting. I had several periods in which I gave it up. In the first months there was a calming of the mind. Then the impression that meditation gives me nothing and I lose my time. I have little free time, so I stopped meditating. This cycle was repeated about 5-6 times. In the end, I managed to overcome it. I meditated for the meditation itself without the expected results. But after a year, my mindfull meditation has changed into something similar to dreaming. These are not single thoughts but the state that you have when you start to sleep. I am able to keep my focus on breath for 10 seconds. It used to be about 10 minutes before the mind started to follow thoughts. Once I could sit in meditation for an hour and it seemed to me that 5 minutes had passed. Now I have enough after a few minutes. I do not see nimiters anymore, I just have the feeling of falling asleep. This discourages me from meditating more than the impression that meditation gives nothing. Still trying but it does not pass. It's been like this almost for a year. You probably experience some kind of very heavy drowsiness that sends you into a hypnagogic state. I dont know what tradition or approach you work with but there are various manuals that explain how to deal with these obstacles effectively. Generally, if you follow a teacher that advises these kind of meditation, you would consult him/her on how to deal with such situations but is not always necessary. Which meditation instructions from which tradition have you been following? A good set of instructions will point out both faulty and faultless meditation along with the various antidotes to apply when you are going off in the wrong direction or not progressing. Study, reflection and meditation are the three wisdom tools. If your meditation isn't progressing you might try to add more study and reflection to identify where you should be aiming. Definitely don't give up, Just experiment with following the meditation instructions of different teachers while also studying to find out what the benefits and common faults are said to be both by the Buddha and any subsequent masters. You can also look up what they say about the drawbacks of not meditating and following the path. You can even look up the scientific benefits of varying kinds of meditation of which there are many. If you still experience even the slightest moment of dissatisfaction, boredom,frustration or pain in your life then you can rest assured that meditation will be beneficial. Many similarities to what I am experiencing or experienced. For me, an interesting thing was that my deepest meditations (including seeing nimittas) were in the beginning (even before coming to Buddhism) and then gradually over the years concentration started diminish to the point that it is hard to sit and meditate. Nowadays I try to watch over my mind in the daily activities. ”Even the water melting from the snow-capped peaks can find its way to the ocean"
Usually if our meditation has declined we can almost bet that it's in part due to an increase in our excitement, dullness and afflictions. Attention is like a muscle that has to be trained regularly otherwise it atrophies. Alan Wallace has conducted studies and wrote a lot about attention within a Buddhist meditation framework. I'm currently reading 'Deep Work' by Cal Newport and although much of it's aimed towards work and productivity, it also applies to any spiritual path or skill you're developing. Last edited by Vasana on Sat Jun 30, 2018 6:36 pm, edited 1 time in total. The five faults and eight antidotes are factors of samatha meditation identified in the Tibetan Buddhist tradition. The five faults identify obstacles to meditation practice, and the eight antidotes are applied to overcome the five faults. This system originates with Maitreyanātha's Madhyānta-vibhāga and is elaborated upon in further texts, such as Kamalaśīla's Stages of Meditation (Bhāvanākrama). This formulation has been commented upon by generations of Tibetan commentators. Shorten your meditation to 5 minutes sitting meditation followed by 5 minutes walking meditation. See if your concentration improves over time. If it does, then add more sessions (with sitting and walking paired) and gradually then increase the sessions to 10 minutes. 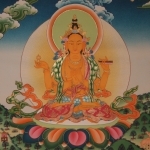 is there a Bodhisattvaa for each jhana? It is better to change mental object as the mind is sinking with that Nimitya. If you continue with that object, many years of habituation with that object may create you the trouble. But, it is just my personal opinion. Anyway, it is best to consult with person who has more experience in such matter if possible. It is said that persisting meditation would imbalance the prana/lung. this is your first post so welcome to the forum. You explain your meditation experience but leave no word about the school or lineage you follow. In case this is none, I would understand that from a certain point your mind sees the senselessness in what you are doing. The antidote for that is vipassana or insight - through teaching and understanding better what you are looking for. Meditation is about wide open with all your senses and your whole consciousness. Feeling as if 5 minutes have passed only instead of a whole hour contradicts that. It sounds as if you have fallen into some dullness state. Obstacles cannot be alleviated through fighting against, you need to find your way to embrace or incorporate them. Keep on looking for the right key to that what you still consider a problem until it ceases being a problem. "like clouds dissolving in the sky"
I recently listened to a recording of five classes in Mahamudra that steps up in meditation instructions and combines that with teachings. Drop me a note if you are interested in this kind of teaching. I started with Zen and Zazen practice, but the Theravada path fits better for me. I feel it in a natural way. Vajrayāna is the most popular in my area. I participated in many lectures and talked with many traveling teachers. They were not able to fully answer my questions. Guru Yoga isn't something for me. I spoke to the Theravada monk only once. I gained the knowledge of this path mainly from online resources. From teachers like Ajahn Brahm, Mingyur Rinpoche (he actually follows Vajrayāna, but he focuses on mindfulness meditation) and recently Yuttadhammo Bhikkhu. I also have a different issue. I see impermanence and the outside world gives less satisfaction than before. But despite the fact that I see and feel it, I do not develop happiness from inside. As a result, the total amount of happiness in my life has decreased a bit. Mingyur Rinpoche teaches purely Vajrayana. Maybe you just happened to meet the wrong Vajrayana teachers before him. Mindfulness is of extreme importance in any Buddhist vehicle. Edit: By Vajrayana I meant all the different levels of teaching found in the Tibetan lineages . Mantra meditation could help. There is even a version of this in the Thai Forest Tradition of Acariya Mun, where the words "Buddho," "Dharmo" & "Sangho" are used as objects of concentration/contemplation. If this is filling your mind, you can't be thinking of the things that are bothering you. To overcome the difficulties you're experiencing, it seems to me that you need to accept where you are, and not indulge thoughts about what benefits the practice will bring. Note the thoughts as "thinking," or even "worrying," but don't pursue them, and re-focus on the sensation of your breath at your nostrils, or your belly rising and falling with each inhale/exhale. There is no past or future this way -- just mental agitation, which can be calmed if you know what to tell yourself when it happens. The real benefit of practice is not that it gives you anything, but that it releases your afflictions over time. If theravada is your thing maybe people at the sister site could offer more focused answers to your questions. each Jhana represents a quality of a Bodhisattva? or that there is a Bodhisattva for each one? maybe i am taking things too figuratively. we assume Bodhisattvas to be other earthly beings or enlightened humans, but what if it is purely figurative? they literally lead you to enlightenment because they are present in each jhana...? just food for thought and discussion. i have no sutra to back me up. Don't oppose that drowsiness. Just watch it coming and remember that you are in the room, just like that. Just let everything pass.